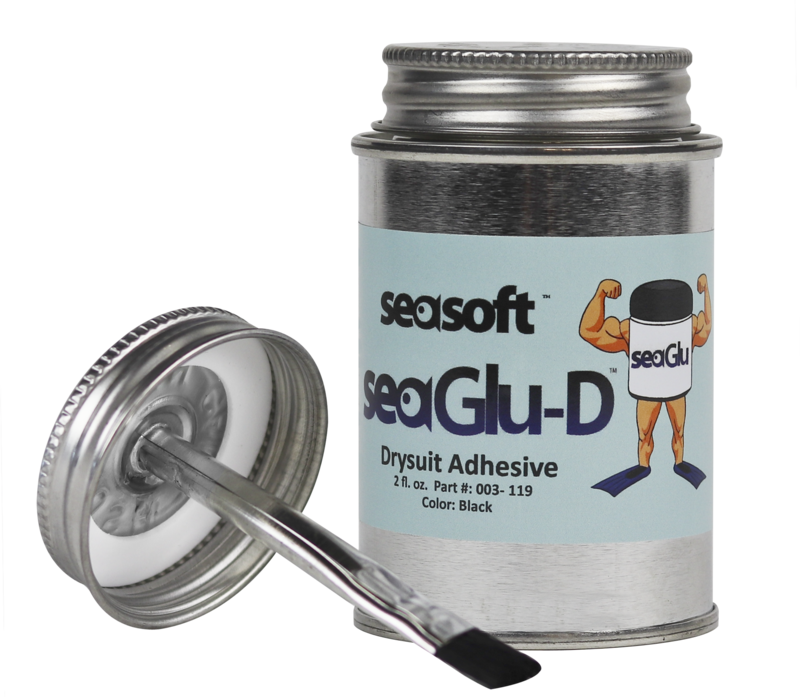 SEASOFT'S SEAGLU-D™ is our drysuit glue we use to manufacture our neoprene drysuits. It is not a cheap knockoff of some watered down wetsuit glue. Customers naturally ask us how it is different than our SEAGLU Wetsuit Adhesive™. 1. Has a stronger bond. 2. Has a little bit less elasticity, maybe 15 to 20% less. 3. It sets up faster so you have less time to mess around but when it sets, it sets. You typically have 15 to 30 seconds. 4. If you are repairing a drysuit and this includes most bag or trilaminate suits it really works with a long-lasting strong bond. 5. Works well with latex seals but you only get one shot. Also, too much glue can damage the latex because of the strong solvents in SEAGLU-D but it works quick and seals extremely well. 1. The fumes from SOLVENTS in SEAGLU-D™ or in the solvents needed to clean up are extremely toxic and can make you sick and can even cause your death. You MUST use a recommended ventilation mask for protection or work in an extremely well-ventilated area. 2. Clean up with "Laquer Thinner" or Toulene. 3. All glues are flammable, be extremely careful around flames and do not smoke while using SeaGLU-D™, have a large fire extinguisher ready if needed. 4. SeaGLU-D™ dries in minutes so it is wiser and more efficient to do small areas at a time. 8. If the lid is not sealed TIGHTLY your SeaGLU-D™ will dry out and is not covered by any warranty!